There are many types of drill bit used in construction and DIY. Using the right bit for the job can save a lot of time and make a hard job easy. If you need to start from scratch, a good starting place is a set of universal twist drills (or titanium twist drills) for wood, metal and plastic, and a set of TCT masonry drills for brick, block, concrete and mortar. Between them these will drill the majority of things used in DIY. If you want another set for better drilling performance in wood you could add a set of lip & spur bits. Here are the bit types generally used in DIY. General purpose bits for drilling wood, plastic, steel etc. Twist drills have angles suited to drilling steel, but the cutting angles and geometry are not ideal for most other materials. Will drill a wide range of materials, but not with particularly good performance. 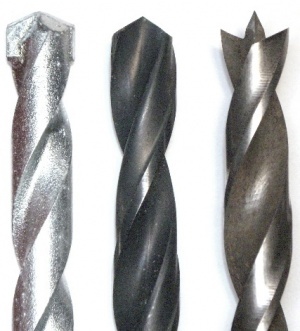 Using more specialised bits with cordless tools considerably increases the number of holes that can be drilled per charge, as universal twist drills are not well matched to most materials and thus have low energy efficiency. When drilling larger holes, it is usually recommended to drill a small hole first, then enlarge it with a bigger bit. This is because twist drills have an area at the centre of the bit with no cutting edge, and the bigger the bit the bigger is this low performance zone. Standard twist drills are made from HSS (high speed steel) and have 118° tips. Its possible to buy 90° tipped bits from engineering suppliers, and these can drill softer materials faster, and thus make more holes per charge with cordless tools. Its also possible to make twist drills with more aggressive cutting angles than this, and thus fast performance in softer materials like wood. Described further down. 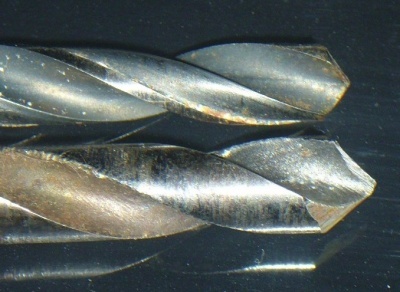 Rarely, twist drills are seen made from softer metals. These have been known to perform surprising feats of transformation during use, such as changing from a right handed twist drill into a left handed one! Twist drills also come in long and stubby forms. These are steel drills with a piece of Tungsten Carbide welded or brazed into the tip. These "TCT" (Tungsten Carbide Tipped) masonry bits are easily recognised as the tip is wider than the shank. The tip is fairly blunt and cuts by crushing a small area of the workpiece under the hammer action of the drilling machine. If used without hammer action the tip wears away quickly. Masonry bits drill brick, block, stone & mortar. 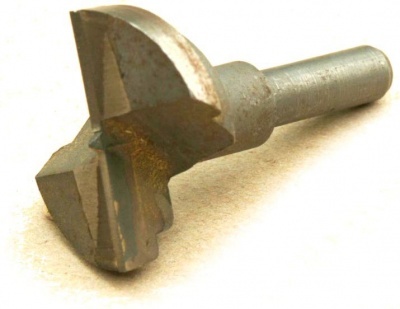 Due to the crushing rather than cutting action, masonry bits can be entirely blunt but still function satisfactorily. They are almost entirely ineffective in wood or metal (due to the lack of a sharp cutting edge), which can be a problem when trying to drill through masonry abutting timber, such as joists or wall-plates. Non-SDS TCT bits often have a dot of red paint on the tip when sold. The paint does absolutely nothing. Masonry bits are available in quite long lengths, typically up to 30cm for non-SDS. Hard masonry (such as some concrete & engineering bricks) require SDS machines and bits. These are similar in principle to hammer drills, but the machines deliver vastly more hammer energy to the bit, and the bits have a special shank which fits into the SDS chuck of the drilling machine with a quick-change locking mechanism, rather than the twist-grip (Jacobs chuck) of conventional drills. The reason for this is not just convenience in changing bits: an SDS bit is free to move back and forward a few millimetres in its chuck and the drilling machine delivers its hammering energy direct to the back of the drill bit. The performance of SDS machines and bits is far beyond conventional hammer drills, particularly in harder materials, and newcomers to SDS often regret not getting one earlier! SDS bits are available in quite long lengths, typically up to a metre, and diameters up to 3cm. SDS drills are only effective on concrete & masonry, with no sharp edge they don't drill wood or steel. Though people have reported managing to mash their way through wood with one. There are 2 sizes of SDS shank on general sale, plus a 3rd not normally seen. The different sizes are not interchangeable, but nearly all SDS equipment is SDS+. SDS+ is the most common size. SDS was originally a smaller standard not normally seen. Products marked SDS are in practice SDS+ size, so SDS and SDS+ can be treated as the same thing for practical purposes. These have a TC tip, but unlike masonry bits the tip is sharpened so that they can readily cut timber and even mild steel. They can cut masonry without hammer action and may cut cleaner holes in soft or crumbling materials due to the absence of lateral impact and vibration. They are particularly useful for fixing through wood or metal into masonry as they avoid the need to change between wood or metal and masonry bits, as well as eliminating the risk of damaging a wood or metal-cutting bit by bringing it into contact with masonry. Note that not all bits sold as "cordless" are equally sharp and effective. Irwin (which Screwfix used to sell as an own-brand) seem to be good in this respect. Screwfix's current offerings include a Bosch set (as well as individual bits) which are probably a good choice. There are also multi-material SDS bits which can cut steel e.g. for drilling reinforced concrete. Also known as dowel drills. These bits have a central point plus cutting edges angled in the opposite direction to universal twist drills. They stay centred in wood, don't wander, and drill wood faster and with less energy than universal twist drills. They also drill holes a little cleaner than universal twist drills. Lip & Spur bits don't drill metal or most plastics. A hexagonal shaft countersink enables quicker changes than round shanked, saving time. Unlike most hex drill bits, hex shanked countersinks are no weaker than round. 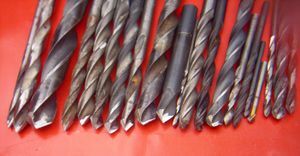 A large twist drill can be used as a countersink if necessary, although the profile of the recess will not be an accurate match for screw heads. HSS countersinks outlast carbon steel many times over. A thin superhard Titanium Nitride coating is applied to twist drills to make them stay sharp longer. These have a gold coloured finish. Performance when new is as twist drills, but performance does not fall off as much over time, due to the hard coating. The coating also gives lower friction than bare steel. Titanium bits can be resharpened once blunt, but lose their advantage when reground. These use less energy than plain HSS bits, so are an advantage compared to HSS bits with cordless drills. For drilling wood, better bit types are available. Aluminium welds itself to HSS during drilling. Titanium bits perform far better with aluminium. Flat bits are low cost low performance drills, and create slightly rough holes in wood. Their low cost makes them most useful for large holes, where other bit types become expensive. Flat bits can be made by cutting bar to size, heating, hammering, hardening, tempering and sharpening. They are the easiest of all drill types to make and the cheapest to buy. Flat bits tend to produce entry surface splintering, make a hole with rough sides, and make a mess of the exit side. If the leading point is allowed to break through they are prone to becoming offcentre during drilling, causing severe vibration and sometimes damage to the sides of the hole. Some of these problems can be avoided by placing scrap wood under the workpiece. Useful where neatness of hole is unimportant, and better quality bits are an unnecessary cost. Drilling progress is slower than with other types, so flat bits are not best suited to drilling large numbers of holes, nor to cordless use. To put it another way, flat bits aren't energy efficient. Its not possible to use a flat bit to enlarge an already existing hole unless the hole is first plugged. Flat bits need a certain amount of pressure to begin drilling, but too much pressure can cause them to jam or throw. Apply enough pressure to cut, but not too much. Some flat bits have a hole in the bit. These can be used to thread wires and cables: a wire is threaded through the hole before the bit is withdrawn. This wire can then be used to thread the cable. Very low speed high torque wood bits with a leading screw thread. Well suited to hand drilling with a brace, but can be handled by most electric drills, though not all. Augers produce a cleaner hole than most drills. Augers are an energy efficient option for large holes, making them good with the cordless tools that can produce enough torque to power them. Augers for drilling soil are also available, and maybe be powered by hand or low speed machine. Prone to jamming. Hexagonal shanked drill bits can be changed by nothing more than pulling one out and slotting another in. This is a real plus for some jobs. When used in push-in hex holders the bits are generally not held firm, and can waggle a bit. A Jacob's chuck is used when more accuracy is needed. Hexagonal chucks that don't hold the bit firm soon result in the bit being left in the work when the drill's removed - a pain. Use a chuck that locks onto the bit. For large holes in masonry, eg 4"
MAD bits can drill curved wide holes. Broken bits are quickly and easily ground to a pointed flat bit shape. No particular skill is needed. These don't cut as well as twist drills, but if your bit breaks during a job, these are much quicker than going to the shop for another bit. Flat bits have a smaller working pressure range than most bits. Too little pressure and it doesn't drill, too much and it sinks too quickly and jams. At low speed these drill through plaster quickly enough, but have little drilling performance on buried water pipes. These bits are typically crude imitations of twist drills, and consist of a metal rod with a small piece of steel attached across the top. Scrape marks on the rod imitate a twist drill. Method of working is like a blunt flat bit, except that the flat tip wears away very quickly in use. These junk grade bits sometimes tempt diyers that only need to drill one hole, and assume the bits will do the task. Disappointment often ensues. Such bits are for all practical purposes non-performers. As an example, one hole in soft brick took around 8 regrinds just to drill the one hole, and the job was hard going and took nearly an hour. An SDS did the 2nd hole in under a minute, effortlessly. Ideal for drilling butter and soft cheeses. These are typically a flat bit with an extendible cutting arm to change the hole width. Low performance bits, but one bit covers a range of hole sizes. Also known as "expansive bits". These typically require a very high torque drill to use successfully since the worm thread tends to pull the bit into the wood aggressively. One can reduce the torque required by pre drilling a small hole to allow clearance for some of the worm thread and hence reducing its pull. These are flat bits with a screw threaded point which helps feed the drill. They also have peripheral leading cutting edges in an attempt to improve cutting performance. They might work better at very low speeds, but in power tools performance is still poor, and the screw thread is prone to grabbing the wood and feeding much too fast. Grabbing can be reduced by predrilling a small pilot hole, blunting the screw tip, or by simply not choosing these bits. These drill wide shallow holes in chipboard for fitting recessed hinges. Used for kitchen unit fitting. Available in two sizes, 26mm & 35mm. Some hinge sinker bits have problems. Review here. Spear pointed TC flat bits for holing glass, tile and other ceramics. Prone to wander badly until the hole gets established. Put tape down and drill through it to counter this. Tend to produce misshapen holes if pushed (as per picture). These can be cleaned up with a masonry bit, gently. These drill rebar, and are an alternative to bolt croppers. The bit shape helps hold the bit in place. Useful for larger sizes of rebar. These drill wide and mostly flat bottomed holes, with the exception of the small central point. They can work upto the edge of the wood, and will also drill overlapping holes. They require considerable pressure to engage in the wood, so are mostly used with a drill press. Twist drill bits can be reground with steep cutting angles to make a bit that will drill wood very much faster than standard twist drills, and with much less force and much lower energy use. Unlike universal twist drils, these bits have minimal or no wander. These bits give much better performance in wood than universal twist drills, lip & spur bits, or any other of the commonly found wood bits. However I've yet to see anywhere selling them ready made, so unless anyone spots them for sale, these bits are diy only. These bits are not suitable for drilling metal or other hard subtances. They're also not suitable for plastic or soft metals; they're for wood only. The bits are weaker than standard twist drills, and must never be pushed. This isn't a problem as they drill quickly and easily with no pushing, even where standard twist drills give up. I've seen a frustrated twist drill user try one of these and cut through the once difficult workpiece like butter. Their disadvantage compared to standard twist drills is that they aren't abuse proof. If pushed during drilling, or used on steel, they chip & break. If used on plastic they jam. These bits cost nothing, because they can be made just as well from worn, blunt, broken or badly ground twist drills as new bits. Concerns have been expressed by some that the bits might be liable to jam or make oversize holes, but having used them for a few years I've never had any such problem. They should not be given to people liable to abuse them. Primarily a saw, but looks like a drill bit, and technically it drills as well. There are many large selection packs of drill bits available, typically bundled with power tools, and often sporting well known brandnames. Unfortunately these packs are too often of poor quality, despite the brand names. Twist drills that don't function can usually be reground to make them work properly. A single bit can drill pilot and clearance hole in one go, if it has different widths at different points in its length. When many identical holes need drilling, these bits save much time. These are available ready made (first picture), but there are several dimensions that matter, and such bits often don't have the dimensions required. 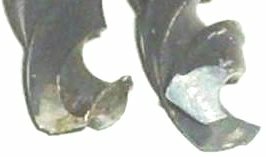 One can produce these bits by taking a long bit and grinding part of it down to the smaller size, as shown in the 2nd picture. Grinding can be done with an angle grinder and drill. The drill bit is rotated while its ground. Grit discs work better than diamond in some cases. In use it should be borne in mind that the drill is long and relatively thin, and that the flutes of the thinner section are shallower than normal. Don't push hard, and clear the bit more often than with a standard bit. It is posible to bolt a hollowed slotted piece of metal onto the drill bit to act as a countersink and depth stop. Where the fixing grubscrew meets the drillbit, a small notch is ground onto the bit to avoid the countersink sliding in use. Despite the compromises inherent in such bits, they are real time savers. Twist drills are available with a reversed twist. These are used for removing screws, they either grab the head and undo the screw, or else drill the head away. These are much more effective than tapered screw extractors. In principle the same 2 sizes in 1 trick can be done with flat bits so they drill a clearance hole and a head recess hole in one go. The design of flat bits places limitations on this though, the holes need to be wide and shallow. Most drill bits are HSS, but this is not hard enough for some tasks. For specialist work there are drill bits made from various harder materials available. Examples include cobalt, solid tungsten carbide, and others. Cone bits are fat cone shaped bits. They enable drilling of a wide range of hole sizes with one bit in soft sheet materials such as plastic and aluminium. Applying the bit to both sides of the hole halves the inevitable variation of the hole width that the cone shape produces. Stepped conical bits give straight sides to the holes they drill, but are restricted to the preset step sizes. This is both a good and bad thing of course. Stepped cones are also used to clean up the edges of holes made by other means in sheet materials. These abrasive grit bits fit an angle grinder, and cut sideways as well as down. Usually used as mortar rakes, they can also drill holes in hard substances such as cast iron. With grit on the sides of the bit as well as tip, hole size and shape is anything from poor to a total mess if not carefully controlled, so they're not usually used to drill holes. The gimlet drill bit has a full width tapered screw thread at the tip, followed by a fluted section somewhat like a twist drill. The screw thread screws into the workpiece forcing the wood apart, and the fluted section then cuts out the wood. The cutting is done by the side of the drill bit, not the end. A very old bit pattern occasionally found on hand drills. Restricted to small hole sizes, a quarter of an inch at most. Can split small pieces of wood. There are 2 types of unpowered hammer drill. One is a metal tube with coarse teeth. Hammer once into brickwork, rotate, hammer, and repeat until done. 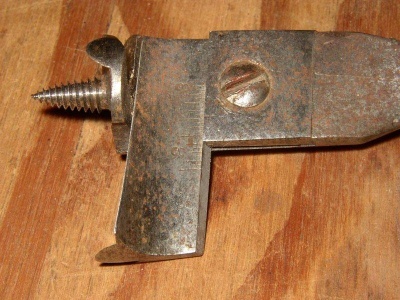 A forerunner of the modern electric hammer drill, these are not much used now. If needed, one can be made from a piece of scaffold pole or other suitable steel tube. They work well with soft bricks and large holes. Cost is much lower than abrasive holesaws. As these are often home made bits using unhardened mild steel, they blunt quickly. The harder they're hammered, the faster they blunt. The other type is just a cold chisel. Hammer, rotate a little, hammer, repeat. Better suited to smaller holes in soft substrates. The hole size and shape is not as well controlled as the above type. Better quality powered drill bits in these sizes are readily available and not too expensive, which limits the use of these basic old bits. A standard masonry bit can be used by hand in this way too, though they rarely are. This should only be done with shallow holes, or jamming is likely. Mortice bits drill square holes. They must be used in a morticing machine. Used for large holes in rock, such as for boreholes. Large twist drills with reduced shank size. Same shank size across the range enables quicker bit changes, and the smaller shank enables use of large diameter bits in standard drills. These remove heavy limescale encrustation without having too much effect on underlying metalwork. The needles use hammer action, and don't rotate. More used in municipal waterworks than domestic situations. These are sharpened hollow metal tubes for holing paper, leather & rubber. Just press and twist. Masonry bits and SDS bits are designed for hammer drilling. Most other bit types used at home are not. PCB drill bits are very small twist drills of various sizes typically around the 1mm area. The tiny HSS hobbyist bits are occasionally useful for diy. Significant care is needed, as the weight of almost any drill is more than enough to snap the bits, and similarly normal sideways movement is enough to snap them. A light cordless drill held with care is best. To put a 1mm bit in a chuck that doesn't tighten down that small, wrap some thin wire round the drill bit shank to increase its width. Put on a single layer of many turns, and the chuck will grip on that. 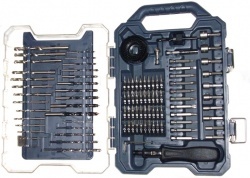 Industrial PCB drills are usually solid tungsten carbide. These don't tolerate the sideways forces that occur in hand held drilling, aren't safely usable in any DIY type drills other than a drill press with a clamped workpiece. PCB drills are intended for use at high rotational speeds, and may in principle be used in a die grinder. However most die grinders use collets rather than a chuck, which severely limits the bit sizes they take. Mini jacob's chucks are available for die grinders. The minimum size they take varies a lot. It just might also perhaps be possible to use various bit sizes by wrapping them with the right wire sizes, and keeping the turns well compacted, but no promises. Long bits with spring steel shanks, these are used to drill holes at an angle to the drill, and may be used to drill studwall timber from a plasterboard hole. Tools are used to guide the bit, but the work is carried out blind. Used more in America than Europe. Straight fluted, but otherwise like twist drills, and with coolant holes. Used for drilling deep holes in metal. Lost your drill bit? Forgot them? Ad hoc bits can get small jobs done. Cut the head off and put screw into drill chuck. Run the drill backwards and it drills. Cut head off with pincers, This leaves a V shaped cut end, which will drill wood. The main bits are in listed roughly best first. Gun Bits - first choice for deep holes in steel. Most popular shank shape. Prone to slipping under heavy load, especially with hammer action. The SDS chuck is necessary to handle the high loads imposed by the SDS hammering system. 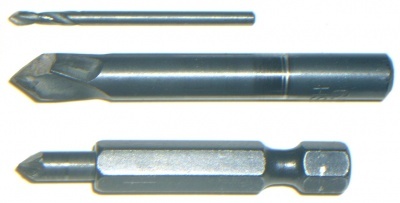 1/4" hex are in widespread use for screwdriving bits & similar. These enable instant drill bit change, but the bond from drill bit to base is often too weak, making them only good for light drilling. Larger hex shanks such as half inch are used to help avoid slippage in conventional non-SDS chucks. Bits with a tapered shank just push in to the taper chuck. There's more than one pitch of taper, giving varying ease of removal after use. When the bit doesn't just pull out, a drift is knocked through a cross-hole in the chuck to remove the bit. These have a tapered square shank. Not generally used in Britain, more used in the US. Flexible shank bits are used to drill through timber wall framing where it's out of sight. The holes are used for electrical cables. Obsolete shank types are normally either usable as is, or the profiled end can be cut off to leave a round shank. Drill bits may be marked in fractions of an inch, millimetres, letter or number. Some imperial and Whitworth sizes match metric, and can happily replace them. Some provide additional fractional mm sizes for metric sets. More information on this here: Size conversion. Blunt or malfunctioning twist drills can be reground with a bench grinder, or with suitable care with an angle grinder. Rusty drill bits can be cleaned using a wire wheel in a die grinder. Bent bits can sometimes be cut (with a grinder) to give a shorter straight bit. Broken bits can be reground. If they're very short they can make stubby bits, as shown. These are handy where access is tight, and even with the smallest amount of flute a bit can be good for some uses. Grinding can be done by hand (slow), by bench grinder (for twist drills) or by angle grinder (with precautions). The tiniest bits, eg 2.5mm and below, can if necessary work on wood with much more primitive regrinding than the proper twist drill shape. Older hand drilling augers can be used in electric drills. Augers with a square tapered shank (intended for use in a brace) can be used in DIY electric drills if the tapered section is cut off. With 2 cutting edges, old augers require more torque than modern augers designed for electric drills, but are quite workable nonetheless. Flat bits can be made to drill a slightly larger hole by grinding one side of the centre point to make it off centre. This isn't often done, as flat bits are cheap and widely available. However this can be used to obtain an intermediate size from a set. The resulting bits wobble so can't be used at speed. Best only used for small size increase. 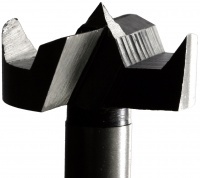 90° twist drills are available from engineering suppliers (as opposed to the usual 118° bits), but the bits described here use more aggressive cutting angles and are much quicker cutting. The picture above shows steep angle bits versus a standard 118 degree bit. The pictures of 2 bits show the fast bit compared to a standard 118° degree bit. Picture 1 shows one of the steeper angles used of the fast bit. Picture 4 shows the smaller central blunter tip width, the central blunt area has been reduced in width by a factor of about 3, and thus is just a ninth the area. To make them an angle grinder is required, as a bench grinder wheel can't reach the necessary parts of the bit. Angle grinders produce far too much heat in the workpiece if used continuously, so must be used gently for 10 or 20 seconds, then the bit cooled. Use very gentle pressure only, more will simply overheat and soften the metal, and ruin the bit. With a little practice the bits can be made in a minute each. Its fair to say not everyone manages to get these bits right, but with a damaged bit you've got little to lose. Always use indirect vent goggles and ear defenders with angle grinders, and keep your face out of the plane of the wheel, which is where the bits go at high speed if the disc breaks. Also be aware of the direction of rotation of the disc; forget the direction and you'll have a fast flying drill bit. Operations where a thin cutting disc is not needed should be done with a (thicker) grinding disc, as cutting discs are not designed to safely handle side loads. Using a grinding disc or bench grinder, create the outline shape of the cutting end, ensuring the point is central and the 2 shoulders are symmetrical. Using a metal grit cutting disc, put the disc into the flutes at the tip to remove the majority of the width of the centre metal at the tip only. Use a grinding disc or bench grinder to create the steeper cutting edges. Don't forget to very gently clean the flute side of the cutting edge to remove burr before the last grind. This requires a cutting disc. Remove much of the metal behind the cutting edges so all the applied pressure will be on the cutting edge. The result is the fastest drill in the west, ideal for wood drilling and cordless use. These bits are very fast cutting, but require more care than traditional 118 degree twist drills. Sometimes people object to these bits on the basis that they'll screw themselves into the wood or produce grossly over-size or misshapen holes. I've been using them for years, and never had these things happen. Tip breakage if not used with some care is their one weakpoint. This page was last modified on 3 December 2017, at 18:09.